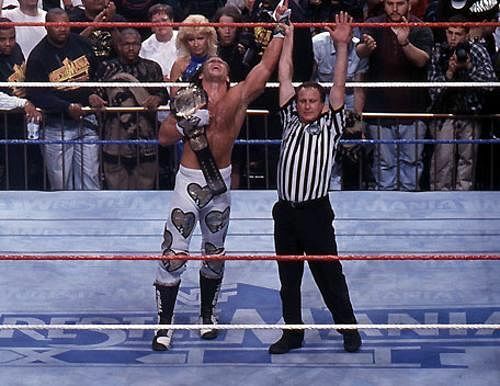 Before there was a Mr. WrestleMania, there was only a young Heartbreak Kid. 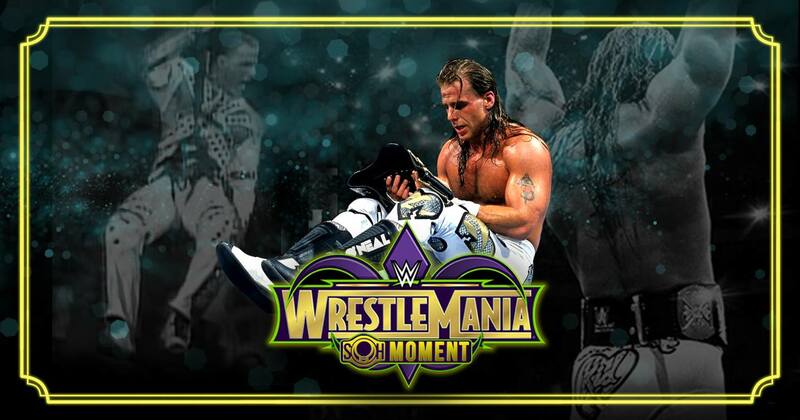 And long before Kenny Omega and Kazuchika Okada went to a 60-minute draw, Shawn Michaels and Bret Hart went over an hour for the WWF Championship in the main event of WrestleMania XII. In 1996, Michaels was a 31-year-old WWF Champion in the making. He had yet to win the sport's grandest title after suffering numerous setbacks and losses in his quest to achieve the proverbial boyhood dream. It wouldn't be his last shot by any means if he lost, but champion Bret Hart wanted to go the distance and prove who was the better man in an hour-long Ironman Match. It should also be noted that despite Shawn's real-life reputation, both men were coming into this match as babyfaces, but with Bret leaning slightly towards villainy. This was the match that featured Michaels's iconic zipline entrance, marking the beginning of a huge legacy in the Grandest Stage of Them All. Well, it would be after all, given that this would be the match where he wins his first-ever world title. The first half of the match was basic. Both men, conserving energy, kept the action to the mat, jockeying for position with various submission holds not meant to make the other submit, but to gradually wear them down. Both knew that it would make no sense to go all-out just to put points on the board, but such was their magnetism that the nearly 19,000-strong crowd at the Arrowhead Pond wasn't bored. They turned things up somewhere near the 30-minute mark, and from then on the action switched to a higher gear, but with Bret in control. (He was the Excellence of Execution, after all.) As the clock wound down, Bret would try to put Shawn away, and Shawn would try to go for Sweet Chin Music, but he couldn't find the opening. Bret would have Shawn in the Sharpshooter when time was up, and as he made his way back up the ramp thinking the match was over, then-onscreen WWF President Gorilla Monsoon orders the match to continue under sudden death rules. Two Sweet Chin Musics later, Shawn would be holding his very first WWF Championship. Other than the fact that a fan favorite like Shawn Michaels won his first world title at the main event of WrestleMania after a hero's journey through failure and disappointment—something that's been repeated rarely, with the likes of Chris Benoit and Michaels trainee Daniel Bryan—it's quite the WrestleMania moment simply because in this day and age, a main event over an hour long would be unheard of (in the WWE, at least). Given the entertainment spectacle WrestleMania has become and how deep the WWE roster is in 2018, there's no way there would be time for any of that now. If we're being honest, Hart vs. Michaels is a relic from a bygone era. That doesn't mean it hasn't aged well, though—it still holds up to the test of time. Even if Shawn was then a selfish youngster out for himself, that first championship victory of his paved the way for a generation of smaller, leaner, and more athletic and magnetic wrestlers rising to the top of the pro wrestling mountain. That's even before Eddie Guerrero's time. And beyond that, it's a reminder that anyone can achieve their boyhood dreams if they put in the hard work. It's stories like this that have inspired many a bright-eyed boy and girl to become future wrestling stars.